My Coot is at the KKMI boatyard in Richmond, CA (authorized John Deere engine servicer) for it's 250-hour, 24-month engine service. Includes valve adjustment and so on. Visited the boat today (Sunday) and the maintenance/service is still in-progress. The haul-out showed the bottom paint and zincs are good for another year. Meanwhile, also having maintenance done to the outside paint. 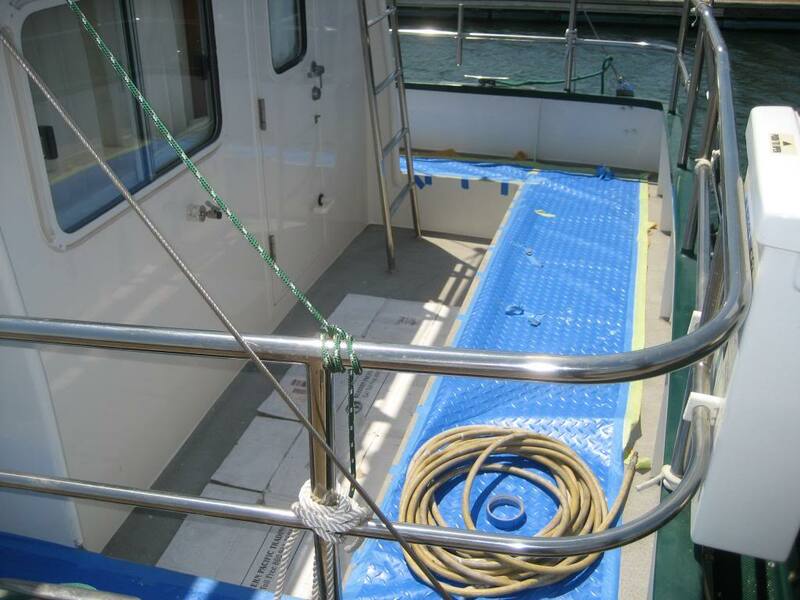 The boat is considered a "yacht" by some because maintenance is mostly done professionally. I was wondering how the haul out was coming, Mark. Good to hear your bottom is in good health. I hope Perla's Deck Dancing didn't cause all that damage above the waterline. Oh heck...even if it did, it would be worth it!! 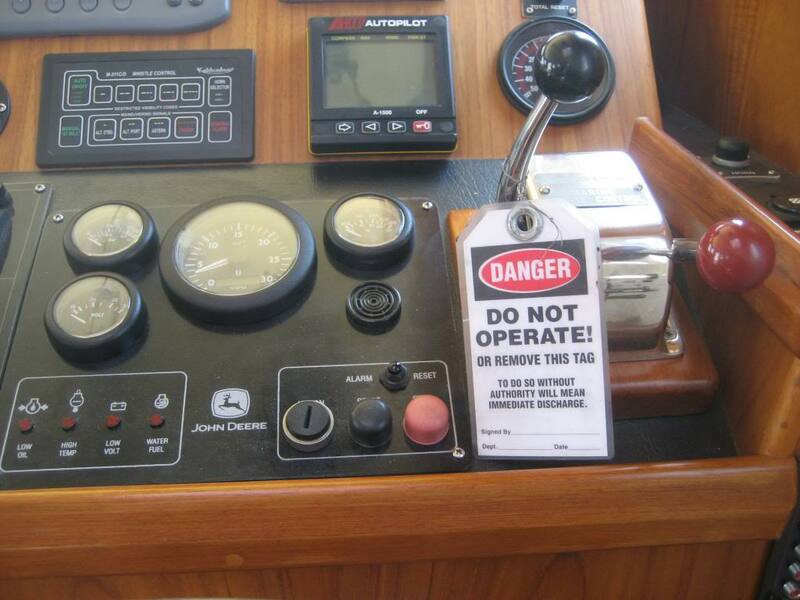 Your shifter tag reminds me of my own "Remove Before Flight" banners I place on the start keys to prevent inadvertent start when conducting maintenance or the thru-hulls are closed. I needed one of those tags after my docking debacle this weekend! 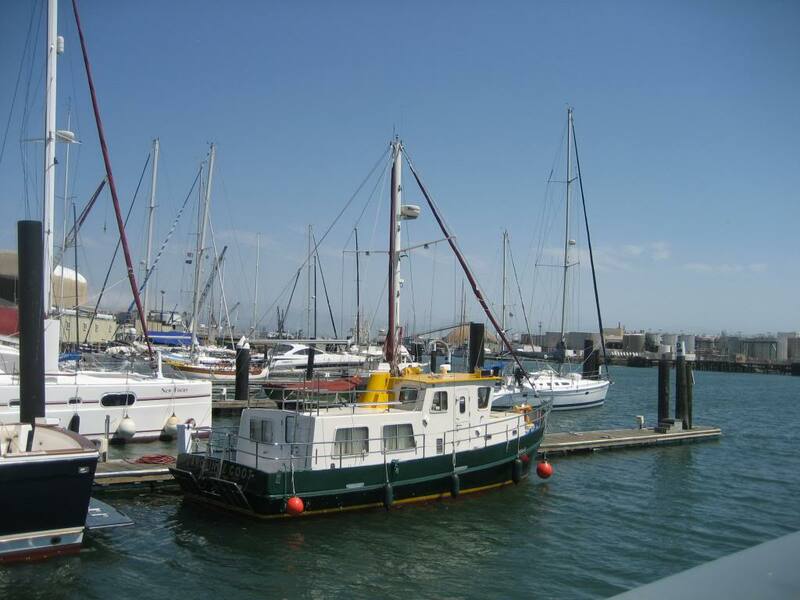 What a beautiful, well-maintained trawler! Al, any dancing will now be confined to the docks! Al and Vashon, I need to see if the boatyard can provide such a tag for my own use. That picture cracks me up! 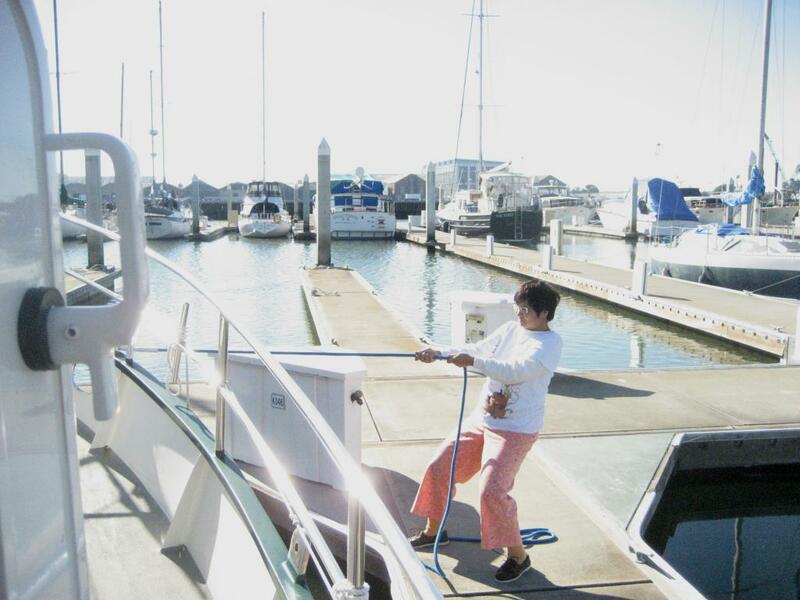 Here's the lovely Perla working the lines like a pro...giving it her all to protect the hull of this mighty vessel...and where's the Capt? He's standing in the starboard door taking pictures! I love it! She's a gem! PM your address and I'll gladly send you one. That could come under the heading of "saving wear and tear on you bow thruster" at the expense of . . . . . . . . Well, you know. Do you know what "standing IN the bight of a line" means? I am very surprised that no one else has pointed out that the photograph illustrates the most common danger in line handling. Rick thank you for that illustration. I'm not sure that applies in Perla's case as she does not have the bight attached to a cleat or anything that could create tension as in your illustration? Please let me know if I am misunderstanding the danger as this is quite a serious matter! So many of us have learned by doing, or from people that have learned by doing, and so don't know things that are common sense to professionals. I'm not sure that applies in Perla's case as she does not have the bight attached to a cleat or anything that could create tension as in your illustration? It doesn't require a great deal of tension to create a hazard. The illustration shows an example that is very common and quite often leads to fatalities or serious injury. Being in any position where a line might run and (in this case) pull the loose line across or under the line handler creates the risk of being knocked over or caught in a loop as the line runs. If she were standing so that all the line was between her and the source of tension it would be different, the worst that could happen is the line would be pulled from her hands. She is shown standing in the bight, the curve formed by a slack line. It doesn't matter that it is not made fast at the loose end yet. What matter is she is standing in the bight, she is in the path the line may take if it runs. As it is in the photo, the line could be pulled around her ankle and drag her over the side or, at the very least, knock her down. 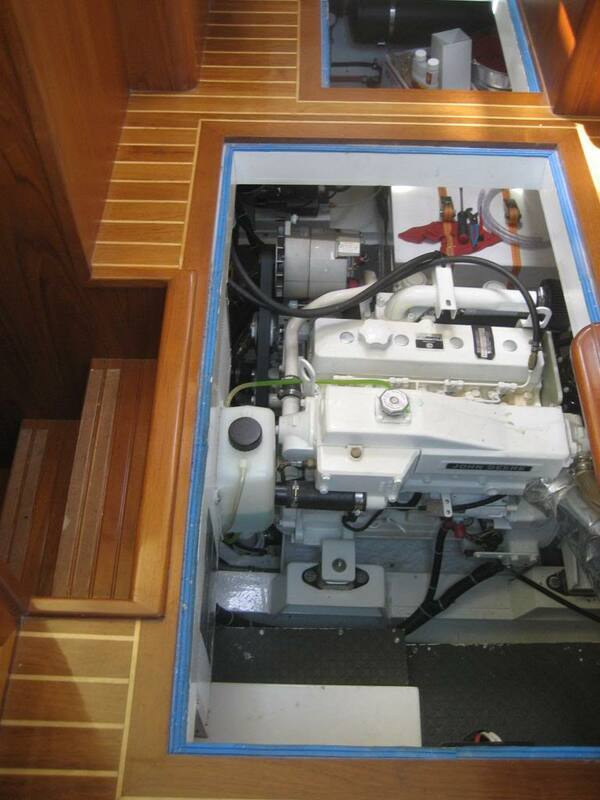 Like many other operations on a boat of any size, there is often more to it than meets the eye of the inexperienced. Premature send - needless to say cup your fingers to hold the line when they can get caught between the line and cleat or whatever. ... needless to say cup your fingers to hold the line when they can get caught between the line and cleat or whatever. And when using small diameter synthetic lines, consider the results of a ring, bracelet, or watchband catching on the line or a splice. Google "gloving injury" and "line handling injuries" if you want some nasty examples of what can happen when even professional mariners get a bit careless or overconfident. And they know full well what the risks are. Besides the bight issue, I would suggest that Perla take a turn around the cleat just aft of her left boat shoe. Trying to hold anything with the displacement of your Coot by hand is an invitation to rope burns. Also it's really amazing how easy it is to hold a load with just a half turn around the cleat if the horns are used properly. The boat is at rest. Perla is merely centering the bow in the berth.